and more time with your kids." It's just one of many frustrations among us mamas....the ever annoying car seat straps getting in the way when we go to put our little ones in their seats to go somewhere. You put the baby in their seat, and then struggle and fight to get the straps out from underneath your little one's little bum to get them around their arms and clipped. I can't count how man boxing matches I have had with car seat straps through our 3 children! "As any parent with small kids knows you are constantly splitting your time between the jobs of being responsible parents and the joys of spending time with your kids. As a dad to 3 small kids this challenge really hit home. So I decided to focus my engineering training and passion for a functional & fashionable design towards solving this problem. What has emerged is a line of products that are focused on improving the day- to-day tasks of parenting by solving those problems you didn’t realize existed with products that are easy to use and safe. This philosophy is embedded in every product in its design as well as its name. All of our products start with the prefix “Lula-” which means ‘easy’ in Zulu, a testament to the products and my country of birth." I know what you're thinking. What in the world could these two little orange hands have to do with car seat straps, and how could they ever be helpful? Trust me, they have been a God sen for me!! Lula Clips hold the car seat straps open while you get your baby in their car seat. They eliminate digging for the straps or fighting to get them out from under your baby, and no more waking sleeping babies because you are fighting with car seat straps! Yes, it really is as easy as it sounds! 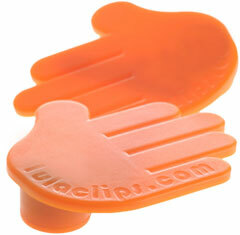 Lula Clips are easy to install, and just as easy to adjust or remove. They also work with all infant car seats! How do these clips work, exactly? Lula Clips clip on to each side of your infant's car seat with a tiny pin that is child proofed and unable to be removed by a child, no matter how hard they try! This child proofed mechanism is patent pending, and I can tell you from first hand experience, that it is impossible for children to remove these clips. I even had a difficult time taking them off to re-adjust them! Though it's hard to see in the above photo, there is a little tab that needs to be pushed down very hard at the same time that the pin itself is being pushed down, in order to release the clip. The "hands" of Lula Clips magnetically hold the car seat buckles out of the way while you get your baby in their car seat. When done, simply take the car seat buckles/straps off of the Lula Clip hands, and buckle your baby in as usual. (Ignore the "Baby Alive" in the car seat...Mason was in bed!) With Lula Clips, there are no annoying adhesive tapes or Velcro, so there is no mess to get gunked up inside of them or underneath them after prolonged use. I could not be happier with this product! I was skeptical at how good they could possibly work when I first got them, but was completely satisfied and happy with the result. We just switched Mason into a convertible car seat, and I have yet to switch the Lula Clips over, but will be doing so tomorrow! I just LOVE them! WIN IT: ONE lucky reader of Mama 2 Multiples is going to WIN their very own set of Lula Clips! Simply follow the instructions in the Rafflecopter form below to enter!